The seminar Showing Without Telling An Alternative Approach to the Trans-Cultural System of Art? 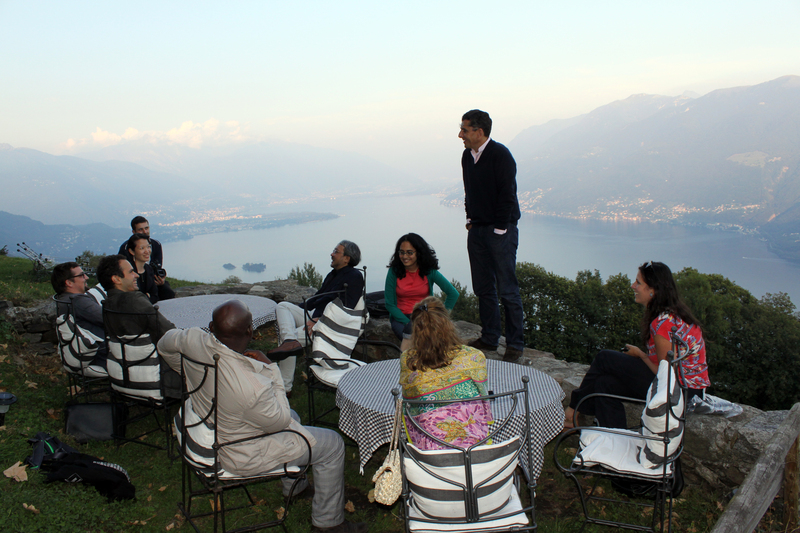 was held in Brissago, Switzerland, Thursday, September 15 – Monday, September 19, 2011. Burger Collection launched the seminar “Showing Without Telling” about the trans-cultural dynamic in contemporary art. Participants included artists BANI ABIDI (Karachi/Berlin), DAMIEN ROACH (London), and BARTHELEMY TOGUO (Paris/Bandjoun), the critic and writer MANUEL CIRAUQUI (Valencia/New York) as well as the researchers ALEXANDRA CHANG (New York) and STEPHEN CHING-KIU CHAN (Hong Kong). The research was established as an extension of the Theory/Conversations, and consists of an on-going series of seminars, lectures and workshops at various sites in different regions of the world. The research serves to deepen both the knowledge about the artistic practices represented in the Burger Collection as well as giving a new twist to the discussion of the much talked of but ambiguous terms ‘trans-cultural’, originally coined by Cuban writer Fernando Ortiz and revived mostly in the late 1980s in the discourse about art. Reaching beyond some of the neo-ethnic takes on art from different regions in the 1990s, but also questioning the more recent inclusion of art in the agenda of geo-political discourse, “Showing Without Telling”, explored how art is conceived of as a specific form of communication between different art regions. It especially tried to convey a complex sense of art that avoids bare applications of information, journalism, or academic knowledge production onto the shifting nature of aesthetic experience. What is it that makes art a specific form of showing without telling? The seminar also addressed the role of the private collection within the system of contemporary art. The term ‘collection’ nowadays seems to be mainly understood as an organization that acquires, stores and lends works of art. But how can a private collection expand such known tasks and become more broadly enmeshed in the social fabric? What transformations are necessary for the collection to eventually become a social medium engaging with the concerns of civil society? – acting as a cultural prime mover across the social and aesthetic spectrum in specific sites. The collection as social medium aims at different levels of understanding by examining its reliable public use. For example, public programs centered on a collection’s holdings, a by now often-applied feature of contemporary collection’s operations, as a measure to establish public use is not entirely convincing. Therefore, what are the alternative measures to be taken? Also, what operations have to be necessarily taken into consideration in terms of a constitution of an authentically public use of a collection? Answering such questions ultimately helps understand the potential—but also the limits—of private collections to engage with diverse audiences as well as with the concerns of civil society. The seminar took into consideration the recent global network of commu­nication and exchange that keeps influencing and alter­ing the production and reception of contemporary art and gave leeway for the interpretation of the concept of trans-culturality, disputing its meaning, application, relevance and use in the present-day art system. The participants were able to calibrate definitions of the trans-cultural object and to look at the eventual mis-readings and misapplications of the complex term, one that is often overshadowed by, or even equated with, terms such as globalization, internationalism, or multi-culturalism. As to the recently much-used term ‘research’: It is understood as a medium to enhance exchange and knowledge in real-time encounters and localized scenarios, to encourage a critical stance and an attitude of intellectual curiosity backed up by historical contextualization. Daniel Kurjaković, curator / head of program of the Burger Collection; in collaboration with Linda Jensen, curatorial assistant, and Sandra Jeker, research assistant. This entry was posted in Alexandra Chang, Bani Abidi, Barthelemy Toguo, Damien Roach, Daniel Kurjakovic, Manuel Cirauqui, Stephen Ching-kiu Chan.